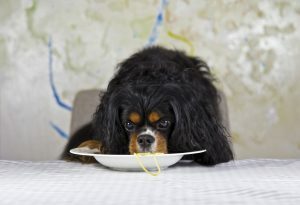 If you decide to change your Cavalier King Charles Spaniel’s diet, do so gradually. Begin by mixing in a little of the new food with your pet’s current dog food. Over of period of a week to 10 days, gradually increase the amount of the new pet food and decrease the amount of the old pet food. Some pets are finicky eaters, but don’t allow them to become tyrants. If you are introducing a new pet food gradually, and your pet refuses the new mixture, don’t go back to their old food just to get them to eat. Just wait. Your Cavalier King Charles Spaniel will eat the new mixture when he becomes hungry enough. We all tend to worry if our pet won’t eat, but skipping his food for a day won’t be fatal. And if you’ve carefully chosen a nutritious pet food that you believe is in your pet’s best interest, it’s better to let your pet go a little bit hungry until he eventually accepts the new pet food you want him to have.